Well, of course, no one loves an alarm clock, and in the world of smartphones and tablets, an alarm clock might seem a little obsolete but if you have missed more than a few morning meetings despite the under the pillow ring and vibration, it is time to get something more permanent on your desk. Moving over the obvious and simple designs, these 20 alarm clocks are going to serve the legitimate purpose of a solid wake up call to a student, professional as well as the heavy sleepers. 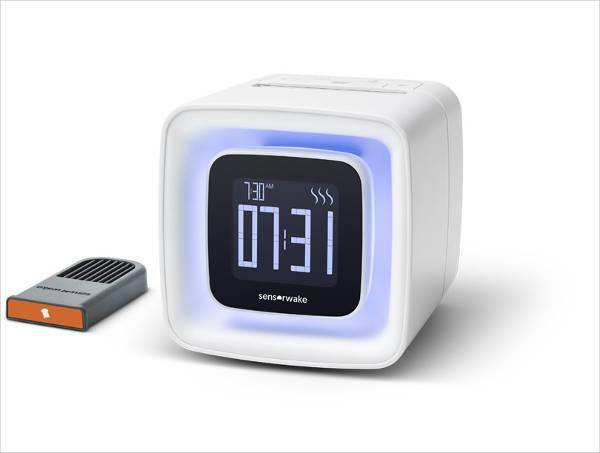 Best for stubborn sleepers, this pressure sensing alarm clock will do the smart trick. The clock actually requires you to physically get out of the bed and stand on it for a complete three second to turn it off. You can preset the alarm and load it with your favourite song to reduce the urge to smash the very next thing kept around. 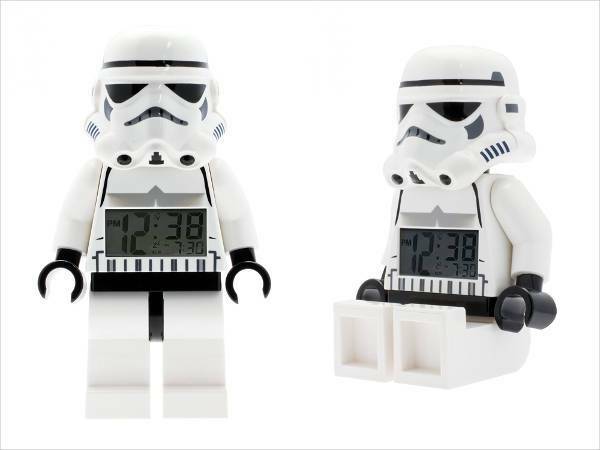 This stormtrooper clock comes with a bright display of numbers on the LCD screen. The adjustable arm points towards the door, giving you the subtle hint to get ready and moving. Best for hungry wakers, this alarm clock uses scent cartridges to wake you up with the scent of favourite things. Right from warm croissant to fresh cut grass, the cartridges come in a wide variety of scent options. You can purchase the set of scents which include toasts, espresso, the seaside, chocolate and much more. 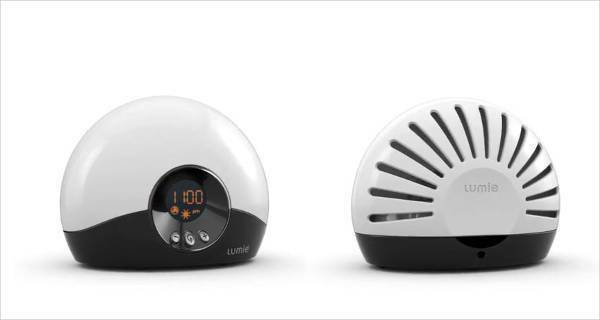 Cute, small and affordable, the cloud shaped clock comes with a ‘pun’ alarm which requires you to come down from cloud nine by triggering it softly with an effective 90-decibel wake-up call. You can also just shake the cloud to snooze the alarm clock. 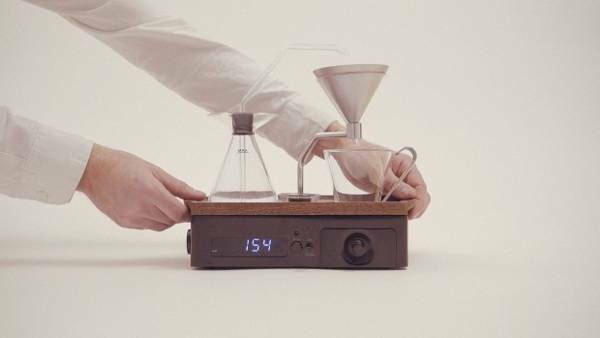 The ultimate alarm clock for all coffee lovers, this Barisieur alarm clock wakes up the sleeper to the smells and sounds of freshly brewed coffee. 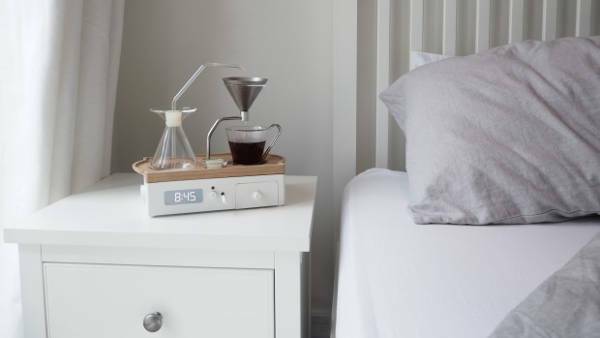 Created by IndieGoGo, the alarm clock doesn’t make the conventional noises to get you out of bed but in fact, brews you a fresh cup of coffee or tea at the time of your choice. This clock wakes up the sleeper by simulating a natural sunrise in the room instead of the shrill beep of a typical alarm. Enhancing productivity and sleep quality, the Bodyclock might cost a little more than the budget clock but trust us, you will thank us later. Along with a sleek body and design, the clock comes with a set of wheels on either side. If you think the wheels are just an added accessory to the clock, let us tell you that you are highly mistaken. After the alarm goes off, the clock will run from your bedside table to the floor, forcing you to get out of the bed and chase it around the room to turn it off. With the Braun digital clock in your room, it will certainly be difficult to lose track of time. 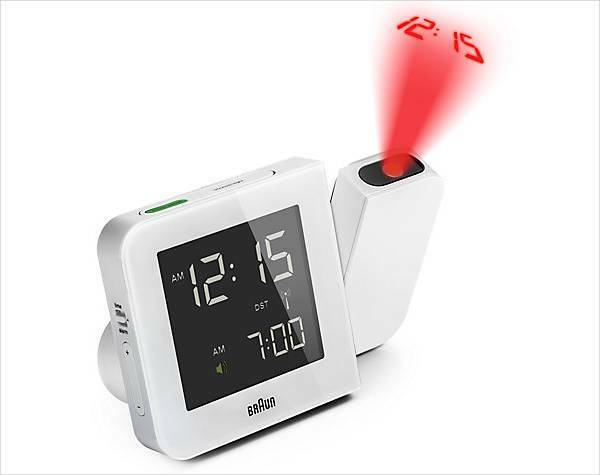 The alarm clock projects the time on the wall or ceiling, preventing you from escaping the fact that you are already 10 minutes late. If you wish to turn off the clock, just wave the hand over the motion sensor and the projection will disappear. 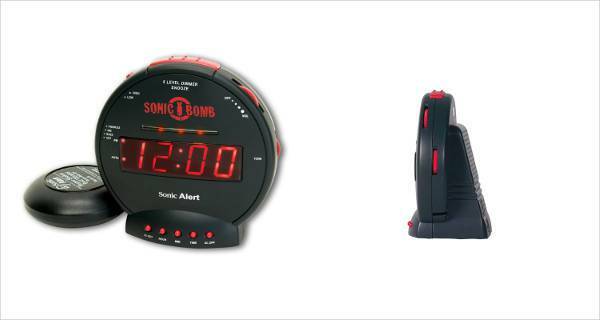 This noisy alarm clock is best suited for the sleepers who tend to snooze the alarm every 10 minutes. With an 113 decibel alarm which is loud as a jackhammer, the alarm clock also comes with the red flashing lights and accompanying bed-shaker unit ( that is supposed to be placed under the mattress). If this doesn’t wake you up! then we would advise you to take up the night shift jobs. 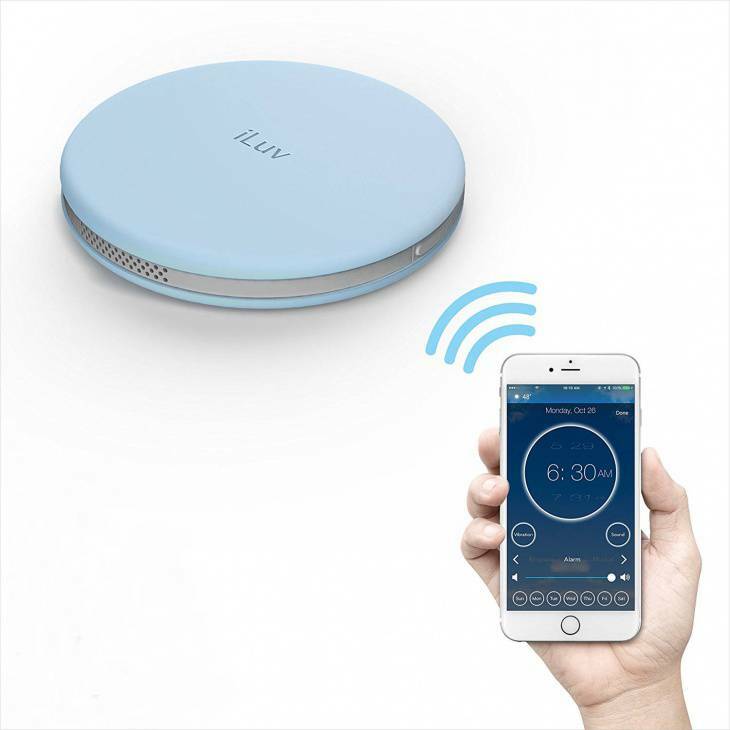 If you have moved away from using a clock completely and set the alarm on the mobile phone, then this SmartShaker by iLuv is the best fit. The device slides under the pillow after your mobile alarm goes off and shakes you awake with determination. 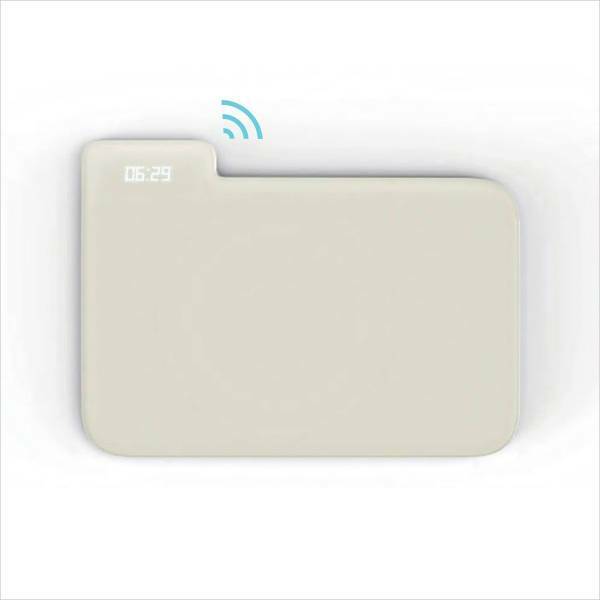 The device connects wirelessly using Bluetooth. This 1.5-pound dumbbell clock is the best way to get some exercise in the hectic morning routine. The clock will only shut off after you have done 30 bicep curls. The clock comes with internal motion sensors, so you would not be able to cheat. 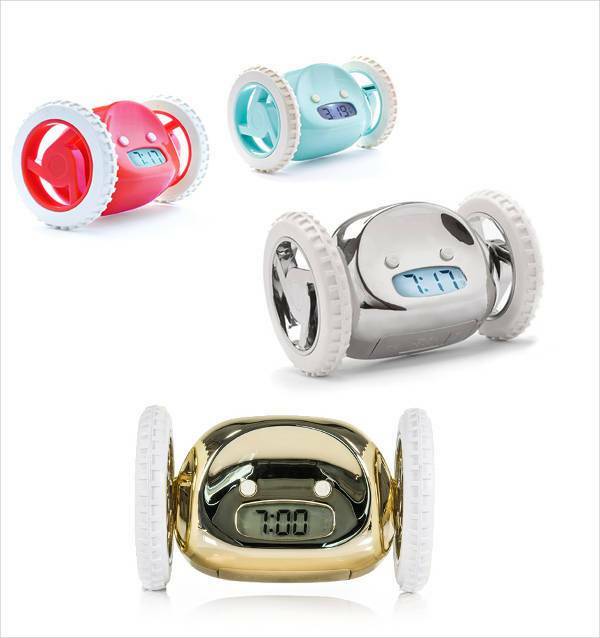 Is the conventional beep not loud enough to wake up, try using this wacky phrase alarm clock! 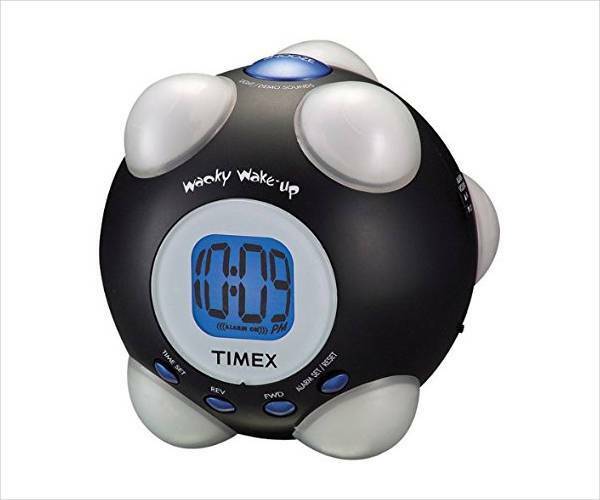 This Timex alarm clock nags you out of bed with seven different sayings in a diverse range of accents that change each time you hit the snooze button. To increase your level of irritation, the clock also comes with a vibrating function. Another choice for a nagging spirited alarm clock, Clockman is a chatty alarm clock that refuses to shut up even after you get out of the bed. Starting from greeting you in the morning, the clock will sing while you get dressed and also yell if you try and anger him. Although the clock just speaks Japanese as of now, but trust us the wake-up and get the ready message will not get lost in translation. 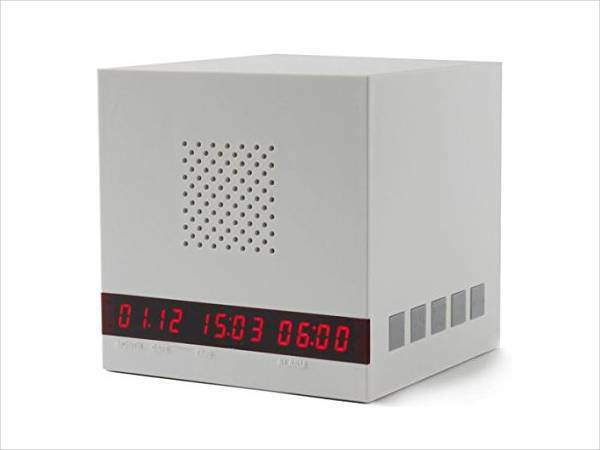 The best part about this pyramid shaped digital clock is that the clock comes with an up-to-date thermometer that tells you the outdoor temperature, so you would know what exactly to wear for the day. 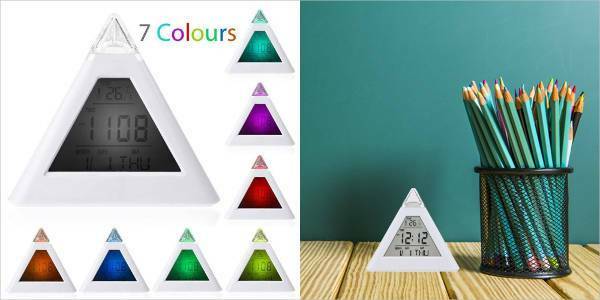 The clock flashes up to seven different colors making it fun to display on the dresser or table. Place Sense by Hello next to your bed and it will help you fall and stay asleep by limiting the level of fatigue that you are generally used to in the morning. The white orb plays sounds that help you drift to the dreamland and the small monitor clipped to your pillow tracks your movements throughout the night. By monitoring the sleep cycle, the alarm will know the best time to wake you up in the morning. Minimally designed, the compact and symmetric square shape fit well on a nightstand and a windowsill. The white and yellow colored frame of the clock will also lend the necessary contrast to the neutral aesthetics of your space. The clock sadly does not offer any snooze button, but it is the smallest sacrifice you can make for the minimalist looks. 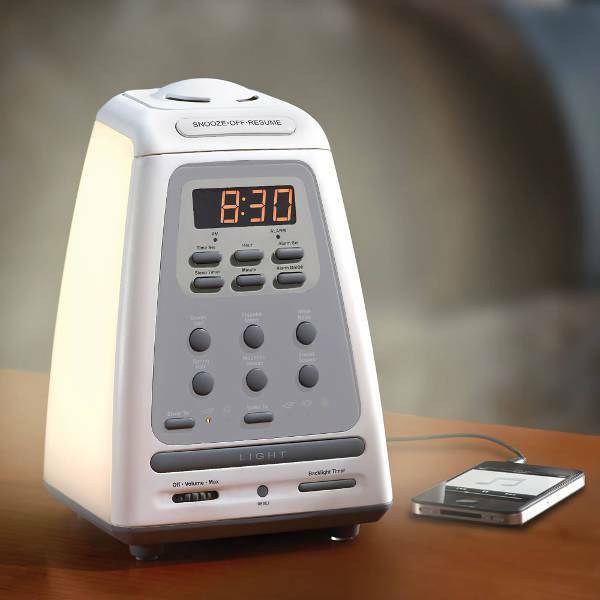 This clock uses aromatherapy, soft light, and subtle sounds to gently wake you up in the calmest way possible. 30 minutes before your alarm is set, it will start glowing softly by radiating golden light in the room. You can also set the clock to release the aromatherapeutic scents along with the light. This fun alarm clock doesn’t just wake you up but also offers you the chance to sharpen your focus and skills. 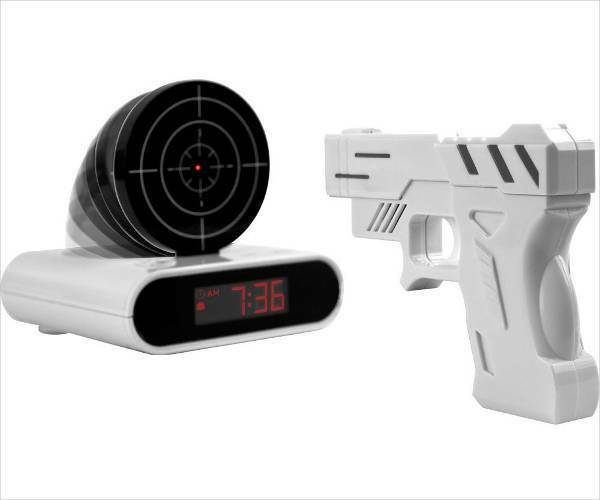 One the alarm is turned on, the only way to turn it off is by grabbing the gun (included in the clock set) and aiming and shooting at the target. Well, this alarm clock would actually require you to open the eyes not just to get out of the bed but also to find the current position and location of the clock. 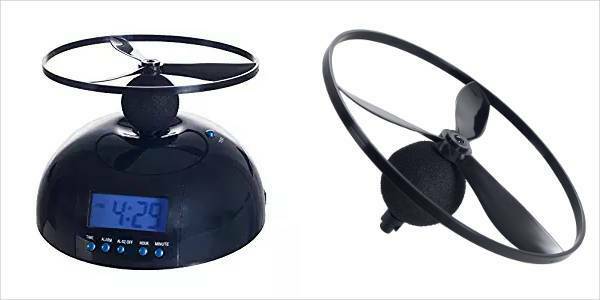 Flying alarm clock wakes you up by making its propeller fly off the alarm. You have to quickly retrieve the propeller detached from the clock and affix it to the alarm clock to stop the sound. 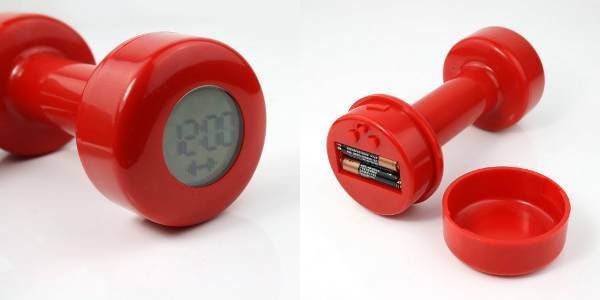 Another creatively designed clock to wake you up from the sleep, this Banclock will only stop ringing if you put a coin in it. This clock is also a great reminder to have some change on hand throughout the day. The dual fold purpose also makes the alarm clock a great option for the kid’s room. 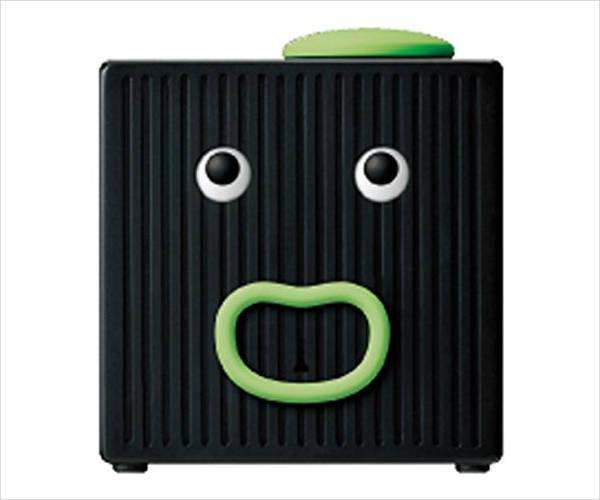 Make your next snooze fun with these creative and stylish alarm clocks.